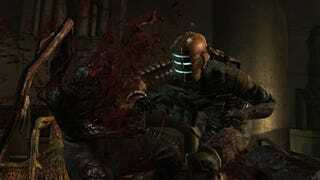 Announced back in 2007, Dead Space is 15-20 hour survival horror title from EA's Redwood Shores. "You can only run and gun it to a certain extent," says dev Alex Charlow. Players are Issac, who's equipped with mining tools as he inspects the innards of a space ship that's been overrun by alien creatures that's comprised of the flesh of the ship's dead crew. The goal is *not* simply to blast the aliens, but to strategically dismember them. "These aren't humans, you can't just shoot them in the head," says Charlow. Instead, players need to shoot off, say, different tentacles of the creatures. But be careful as they can play dead! Game drops this October.